Millfield is a three bedroom semi-detached holiday home in a private development of 4 houses only. A ten minute walk along a lit footpath brings you to Kenmare town which is renowned for its restaurants, traditional pubs, craft shops and farmers market. 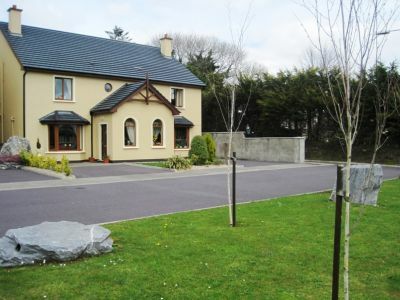 Rated 4 stars by Bord Failte Ireland, this home is stylish, comfortable and tastefully decorated with spacious accommodation. The house accommodates 5 people. There are wooden floors throughout the house. The sitting room boasts a very unique stone fire place, a starter pack of wood and logs are supplied. Perfect for those chilly evenings. It also has a 42″ plasma T.V with multi-channel and a DVD. The kitchen is well equipped with a dining area off it. Double doors lead into the patio area with its BBQ and picnic bench as well as an enclosed and private landscaped garden. There is also a downstairs toilet and utility room. Upstairs comprises of three bright and airy bedrooms with plenty of storage, the master bedroom is en-suite. It also has a family bathroom and overhead shower. Sheets and towels provided. The welcome pack includes tea/coffee/sugar/milk, bottle of wine, chocolates, cake and farm fresh eggs as well as all your household basic for the week. The front of the property has a landscaped garden with shrubs, birch trees and beech hedging. Kerry Way Walks are 100m from property. Mountain views surround the property and there is private parking for 2 cars. Free WiFi available locally .Kenmare Bay Hotel with its swimming pool and leisure facilities, Brooklane Hotel and Centra supermarket are 300m away. Oil and electricity is meter read which means you pay for what you use. Sorry no pets and no smoking. Kilgarvan/Cork Direction Enter Kenmare town via Shelbourne Street and turn right into Henry Street (Post Office opposite you). At the end of Henry Street, turn left onto the square (Quills opposite you). Follow this road over the bridge until you see the Centra Shop / Petrol Station on your right. Take the first left (N70) pass the Kenmare Bay Hotel entrance, Millfield is a 300m drive and located on your right to no 2 Millfield is second property on the right. From the Molls Gap / Killarney Direction Before you enter Kenmare Town look for the N70 route signposted for Sneen/Ring of Kerry on the right hand side. Take this route pass the Kenmare Bay Hotel entrance, Millfield is a 300m drive and located on your right to no 2 Millfield is second property on the right.